Thousand Islands country, ... .... That's the nickname given to the Moluccas, one of Indonesia's eastern tip region has a cluster of islands with diverse cultures, languages ​​and customs and abundant natural resources and matchless beauty. Of the many scattered villages in the Moluccas, Morella is one of the country that holds a million indigenous strengths and beauty. 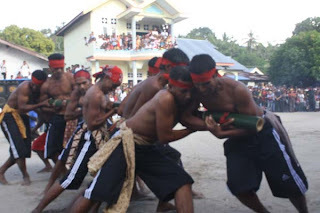 Located on the Peninsula Leihitu, cheek by jowl with the other two villages namely Home Affairs and State Mamala Liang, located approximately 35.km of Ambon, the capital of Maluku Province. Travel can be taken for 45 minutes by road from downtown Ambon (Terminal red stone). Kapahaha Castle is one formed by a natural .fortress located on the headland devil, less 200 m from the beach and within walking distance. Various historical heritage of the fighters and objects old graves can still be found in these places (most have been kept in the house of King / Head of Village). Sawatelu Beach which is located in the bay sawatelu has beauty but not least when compared with other tourist attractions in the Moluccas. Large-sized sandy beach with stunning natural scenery around could be one option to relieve fatigue after six days carrying out an exhausting routine. 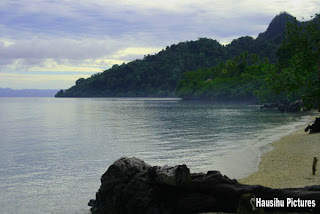 The position of the beach which is located on a bend bay sawatelu with adjoining stream to give the feel of its own. For those of you who like to diving, Along the coast to the promontory sawatelu devil, there is a marine park that is not less beautiful in Bunaken. Marine park has a diverse marine biota. The fish various shapes and colors, clusters of coral-reefs in various forms a charming and various other types of biota. All three attractions are (Fort Kapahaha, Sawatelu Beach and Marine Park) is located contiguous to each other so that makes it easy for travelers to make choices without having to spend to move the location. Like the saying goes once a row, two of the three islands exceeded. Once visited, three tourist sites visited. It is said that the story that gave birth to a tradition started when a broom at the release of prisoners occurred in kapahaha by Dutch colonial fort in the bay sawatelu. Surge of excitement as well as compassion mixed with the spirit of patriotism was applied in the form of strike action yourself by using a broom. According to historical records the incident occurred on 7 syawal which later developed into a tradition of seven syawal by local communities for generations. In celebration, other attractions are also displayed at the broom dances Cakalele areas such as dance to the accompaniment of traditional music is also featured attraction of bamboo crazy. In Mad Bamboo spectator attraction given the opportunity to go try a show of force holding the bamboo that has been filled with the spirits of the ancestors by the handler. Surely it can be a special experience for tourists.